So a while back, I mentioned that I was thinking of starting a segment on the blog entitled “You’re a vegan? What do you eat?” I’ve decided to try to do this once a week (I’m tentatively thinking Wednesdays). I feel like, for the 11 years that I’ve been a vegetarian, I’ve had a pretty good diet, but ever since becoming a vegan, my diet has improved by leaps and bounds. Seriously, I’ve never felt better. Most people seem to think that eating a vegan diet must be impossibly difficult (an opinion I definitely shared before actually trying it myself), but really, it’s pretty easy. I’ll start off by introducing a winter staple around the Ragfield house: Minestrone soup. I generally don’t follow a recipe for this (just using whatever I have on hand), but a good template for this soup can be found at Vegan A Go-Go. Some basic essentials are garlic, onions, celery, and carrots. Beyond that you need kidney beans, tomatoes, vegetable broth, and some kind of pasta. I also usually add chopped kale and red cabbage. The particular soup in this photo was actually proclaimed Melissa’s Best Ever Minestrone by none other than Rob. And it was really great. The thing is, I’m not sure what I did to make it so great, and I’ve never quite been able to reproduce it. What I am sort of suspecting is that in this particular batch, I’d used the last of the garden tomatoes (the ones I’d picked green before the first frost and let ripen in a paper bag in our pantry). Maybe it’s the canned tomatoes that make this soup a little lack-luster. 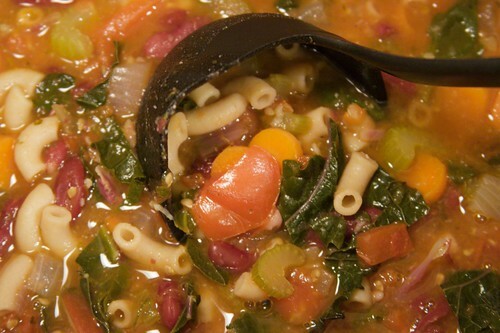 Even so, a sub-par minestrone is still pretty good. 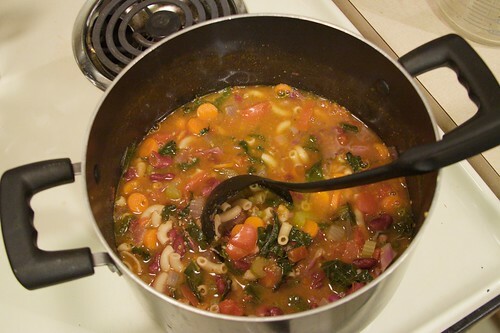 And right about now, minestrone is Rob’s favorite thing to eat. He doesn’t mind eating batch after batch of the soup as I try to recreate that Best Ever Minestrone made with the season’s last fresh tomatoes. The SOUP looks delicious! Speaking of your diet and feeling better than ever, I must say, you look very healthy as well. Hopefully, you're sleep patterns will improve too. Although, I don't expect that will be getting better until your dissertation is finished! !